On Saturday I participated in an event at Wheatland, home of President James Buchanan in Lancaster, PA. 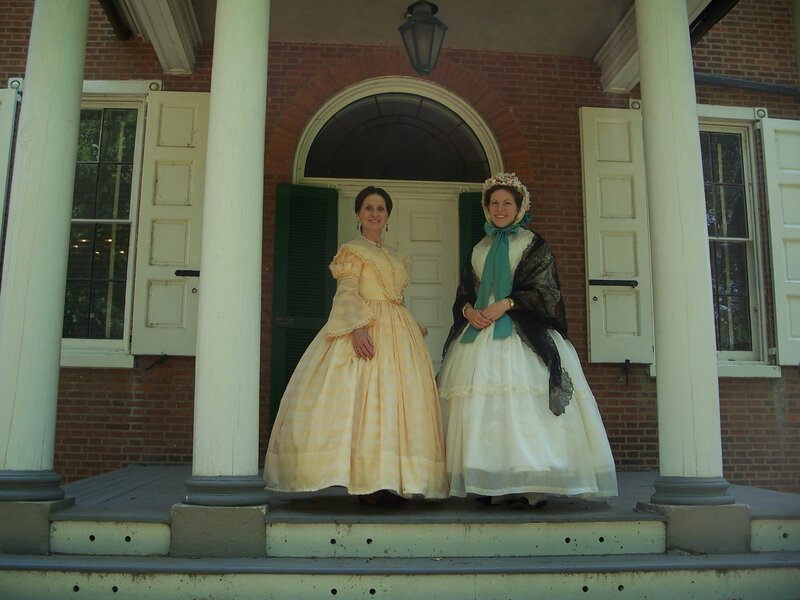 The event was a free event for the public, and an opportunity for locals to visit Wheatland and learn about James Buchanan, Harriet Lane, Wheatland, and the Victorian era. There were various educational stations, and a period picnic. 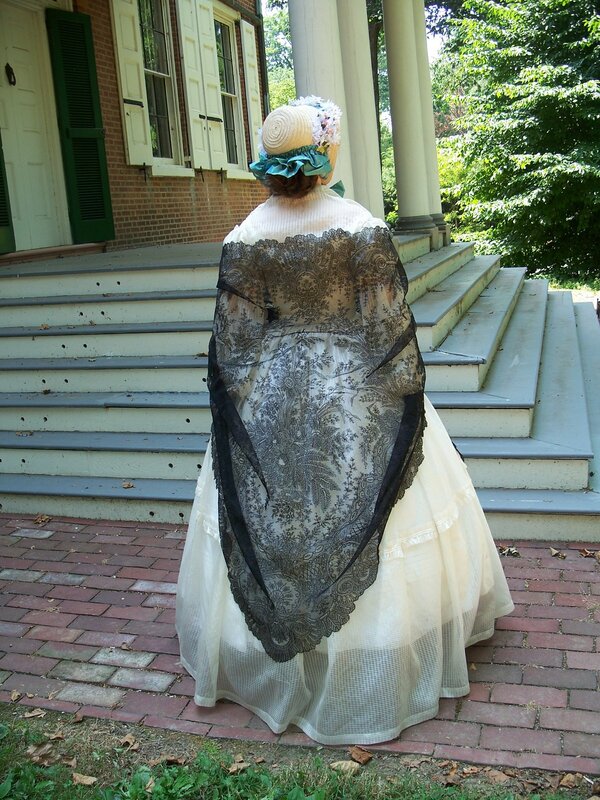 My mother, Nancy, who is a docent at the museum, was asked to speak about fashion in the formal parlor. I agreed to come along to help her. We had a wonderful time talking about the latest summer fashions and showing our various accessories. 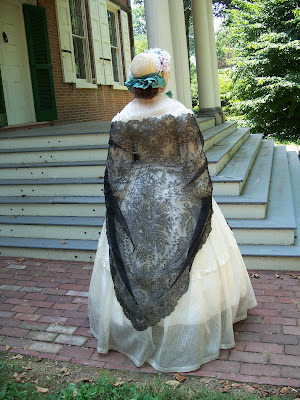 Visitors seemed very interested in the fashions and learning about what women wore in the 1860s. 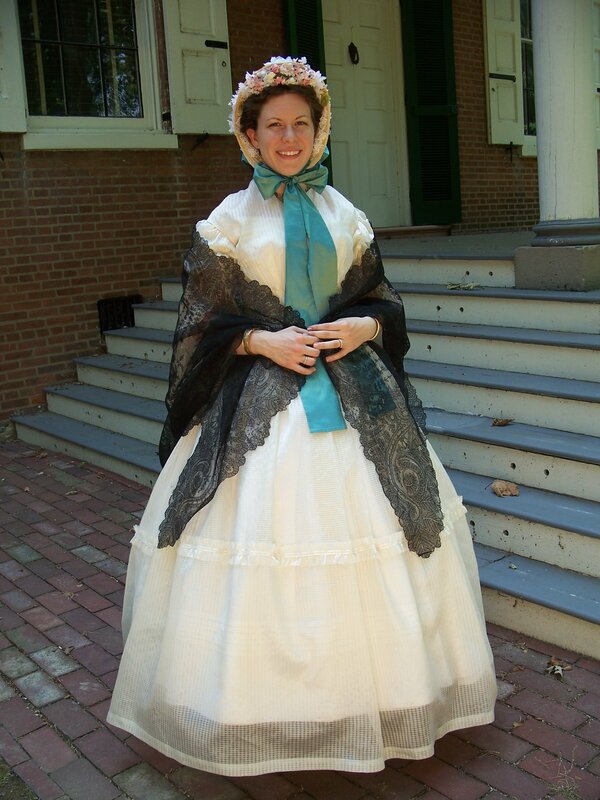 I wore my sheer silk dress and my newly completed straw bonnet. This straw bonnet form was made for me by Beverly Lister; a milliner who creates fabulous 1860s confections. About ten years ago I organized a bonnet workshop with our local civil war group, and Beverly kindly agreed to come and teach us how to trim the straw bonnet forms that we purchased from her. I was so busy hosting the event that I didn’t get very far on my bonnet, and it’s taken me up until this summer to put the finishing touches on it! While in Lancaster, my mother and I visited Beverly’s studio where my mother ordered a new straw bonnet and I purchased this original Chantilly lace shawl from her. Perfect timing, because I was able to wear it to this event! 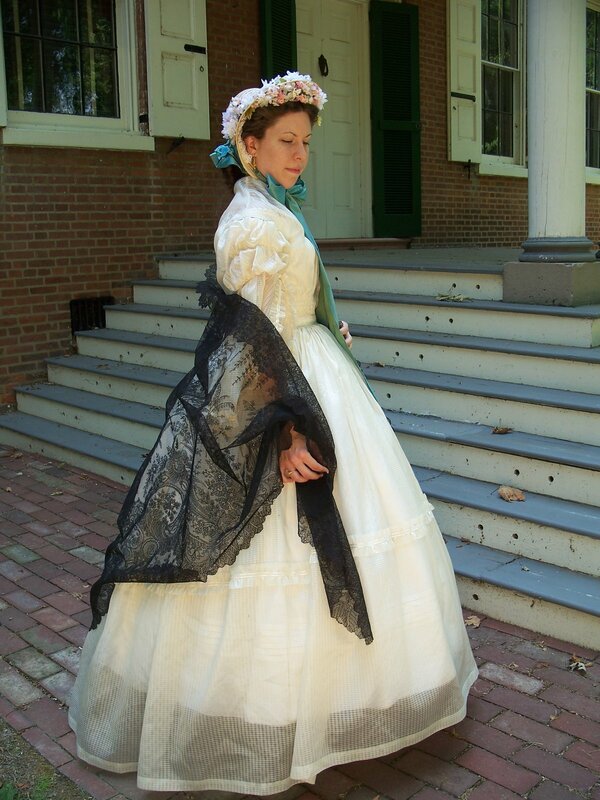 If you’re ever in the market for 1860’s reproduction millinery, I highly recommend Beverly’s work. It’s always a delight to have one of her creations. 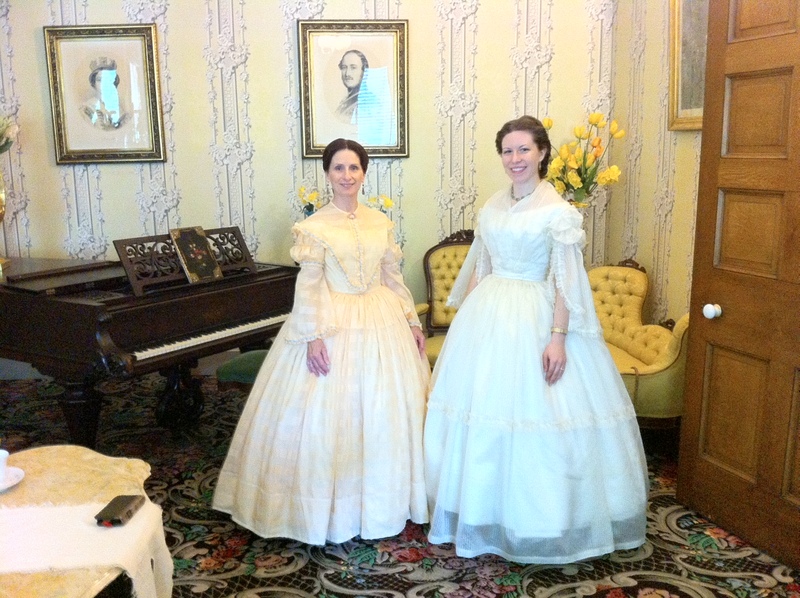 Nancy and Lindsey in the Formal Parlor at Wheatland. My mother is wearing her latest creation, a new sheer dress. The pagoda sleeves are detachable and the triangular pelerine can be removed to change the look of the dress for evening. My new bonnet and shawl. On the porch at Wheatland. WOW!!!!! GORGEOUS! What a magnificent shawl too. You look like a summer's day in the lovely white. Yes, you both look really gorgeous and very comfortable on an extremely hot day in Pennsylvania. You both look so gorgeous and comfortable on an extremely hot day in central Pennsylvania. Lovely mid-19th century creations all around! And that shawl is absolutely to die for! Oh, that shawl!!! What a special find. You both look lovely, and I especially like the details of your dress sleeves. So pretty! You ladies look stunning! I hope one day to make a Civil War dress. It's on my costume to make list.